« R&Q Webinar: What is sufficient clinical evidence to meet the EU MDR? 2019 marks the 13th year of BioOhio’s Ohio Bioscience Career Fairs. Upcoming events are being planned for February in central and southwest Ohio. A northeast Ohio event will be held based on demand from area employers. 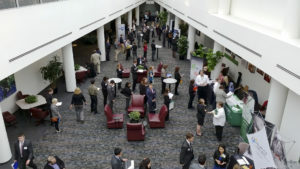 Attending the Ohio Ohio Bioscience Career Fairs is free for job seekers. Interested in spreading the word about the Ohio Bioscience Career fairs? Click here to download a flyer to share with your department, campus, students, and fellow educators! Contact us with any questions. Support from sponsors helps make BioOhio’s bioscience career fairs possible. Sponsorship is $1,250 for one or $2,000 for both events. Benefits include exhibit space, logo visibility on marketing materials (pre-event and on-site), a half-page in the exhibitor booklet, and mention in the pre-event press release and the post-event summary. To become a sponsor of future events, contact Jen Goldsberry at (614) 675-3686 x 1004 or jgoldsberry@bioohio.com. Click here to view the 2010 exhibiting companies! Employers! Click here to exhibit at the Career Fair!